Happy Friday! Time for another Bloggers Challenge - this weeks theme is Christmas in July. The inspiration for my layout came from MMSC11 with LOTS of creative liberties by me using the sketch. I just wasn't feeling this sketch, so I used the basic layout, leaving off the 3 elements on the bottom and replacing them with the sentiment, I also left off the "hanging" thing. In other words, I guess you can say my layout was "inspired by" the original MMSC11 sketch, altered to fit my needs. 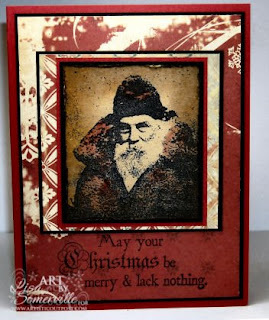 The beautiful Santa image and sentiment are from the Snowy Woods Plate at Artistic Outpost. I used the Burnt Edges Technique on a Manilla Tag, once dry, I stamped the Santa image in Black Archival, and colored his suit with Aged Mahogany Ink. Don't forget, Artistic Outpost is having a Christmas in July Sale - all Holiday Themed plates are on sale - use code LS-15off to save 15% on all purchases at Artistic Outpost, even sale items! Thanks for stopping by! Looking for more Christmas inspiration, be sure to click on the Bloggers Challenge Logo on my sidebar to visit the other Challenge Members Blogs. A beautiful card, Lisa, full of old world charm and ambiance. Great card, Lisa! Love this vintage look! Love this images and the sentiment is great! Fabulous Christmas card. Great vintage card, Lisa! Just lovely! I love the look that the burnt edges gave to your card! Gorgeous color choices! oh, you are bringing out that wonderful Christmas set! Love it! Beautiful! You've really captured the Old World Aged look with this card. Very Vintage. I can't stand thinking about Christmas in July (because of the idea of winter)...but this is fantastic, Lisa! Beautiful card...and that paper is wow! This is gorgeous, Lisa! Love the vintage look you created to match the image. Wow! Great burnt edges, and I love that Santa image! This is fabulous Lisa!!! Love how you've given this a truly vintage look!!! Stunning, Lisa!! Love, love, love the vintage feel to this card! Great image Lisa, love that paper along with the sentiment, perfect holiday card. Beautiful! I love this Santa and the way you color it! Lisa, this is just drop dead beautiful!!! I love that image and the rest of the card too!! !